As popular as it has become, Beach Wok is a relatively new addition to the central coast dining scene. 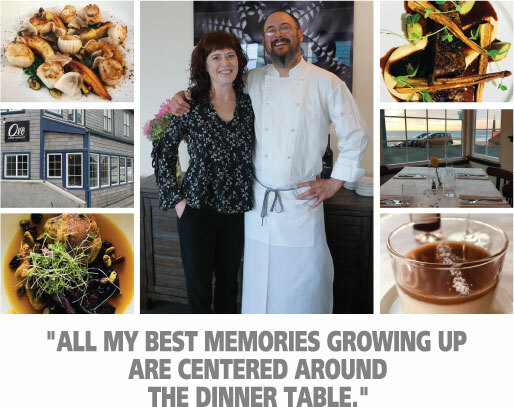 But Timm and Tammy Lakey, the Pacific City restaurant’s owners, are far from new to the business. Timm, a native of the Willamette Valley, has worked in the industry his entire adult life. Tammy, whose mother is Vietnamese and father was an American soldier, was born in Saigon and raised in Kingston, Washington, where her parents have owned a restaurant for 39 years. Tammy started working in the family business at a very early age, in fact she remembers that the school bus would drop her off at the restaurant. The Lakeys opened a restaurant in Hood River, which they successfully operated for more than a dozen years. While living in Hood River they invested in a home in Pacific City, which they intended to use as a vacation rental, with the hope of being able to move to the coast within five to ten years. When an unsolicited offer was made for their Hood River restaurant, they were able to move fulltime to Pacific City ahead of schedule. Timm took a job bartending and serving at the Pelican Brewing Company, where Tammy became a manager. Between kayaking, crabbing, fishing and walking their dogs on the beach, the Lakeys quickly fell in love with living fulltime at the coast. 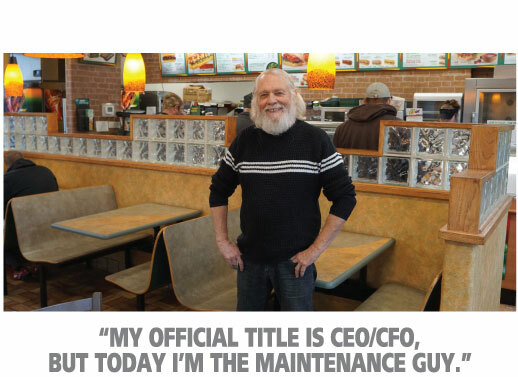 Soon they were searching to purchase a building to open a restaurant in Pacific City of their own. 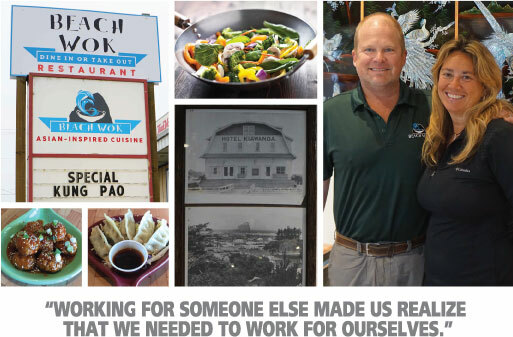 Beach Wok opened in July of 2017 and has built a loyal and enthusiastic customer base. The Asian-inspired menu features many recipes from Tammy’s mom, including Vietnamese Baby Back Ribs, Banh Mi sandwiches and Pad Thai. Homemade Korean Meatballs tossed in a citrus chili soy glaze, General Tso’s Fried Chicken and Bacon Katsu Skewers are just a sampling of other popular items. Nothing is pre-made. Even the meats are hand cut. Vegan and gluten-free offerings are extensive. Draft beers include Kirin Ichiban, Breakside IPA and a rotating tap selected by Timm, an admitted “hophead”. Oregon wine is sold by the bottle, glass or in bottles to go. Asian Mojitos are the most popular house-made cocktails. The Lakeys and their customers often salute each other with post-meal shots of Japanese Gekkeikan Sake. Beach Wok’s unique décor features custom woodwork by Timm fashioned from an old dock found at a local kayak shop. The dock wood was also used to frame historical photos of the area. While Timm is the chef and Tammy runs the front of the house, it’s not unusual for both to cook, bartend or serve customers. Beach Wok, which now employs five, is open for lunch and dinner five days a week; Friday through Tuesday. With book work in the morning, Timm and Tammy typically work 15-hour days. Even on their “off days” they’ll spend several hours doing restaurant prep work. Despite the long hours, Timm and Tammy are still excited to come to work each day. “It’s what we do, it’s what we’ve done for our whole lives, we love it,” explains Tammy. Yet the couple still likes “to play” during their time off. Timm, an avid motorcyclist, has hit 178 mph racing his Ducati on the track at Portland International Raceway.